Running an e-commerce store without analytics is like driving blindfolded: sooner or later, it’s going to end in disaster. Analytics gives you a better understanding of your business. It tells you who your customers are, where they’re coming from, and what they’re buying. It doesn’t matter whether you’re running an e-commerce behemoth doing $10 million of revenue per year, or a tiny little blog. You need analytics to succeed. In this post, we’ll give you a thorough overview of how to use Google Analytics with your online store. You’ll learn why analytics matters, how to use it with Ecwid, and how to create simple reports to better understand your business. Google Analytics (GA) gives you crucial information about your business and your visitors. It provides you with traffic data, sales figures, conversion rates, and even customer demographics. It tells you the platform your visitors use (mobile vs. desktop, Android vs. iOS), their country of origin, and the source of your traffic, whether it’s from search or. social. It also tells you how many of your visitors convert to customers, and whether your marketing tactics are actually working to generate more business. Use #GoogleAnalytics to know how many of your store visitors convert to customers. Track email marketing success: Use GA to figure out how many visitors land on your site through email to gauge the success of your newsletter. Measure visitor engagement: The longer a customer stays on your site, the more engaged he or she is. GA helps you measure this. Measure marketing efforts: Track your traffic coming through social media and search engines to measure the effectiveness of your marketing campaigns. Conversion rates: GA can help you figure out how many of your visitors become paying customers. This is great for tracking sales figures and conversion rates. Visualize sales funnels: Use GA goal tracking and funnel visualizations to better understand your checkout process and optimize it. Perhaps most importantly, GA makes it easy to measure all these metrics from a single dashboard. Instead of fiddling around with multiple data sets and Excel spreadsheets, you can get a quick measure of your store’s performance through the Google Analytics dashboard and its custom reports. Sign up for Google Analytics here. You will be asked to create a Google account if you don’t already have one. Add your site to Google Analytics. This is the step that enables GA to work throughout your site. Get your web property ID. This is the unique tracking code that Ecwid uses to work in conjunction with GA.
Log into your Ecwid control panel, go to System Settings → General → Store Profile and enter the web property ID in step #3 into the Google Analytics option. 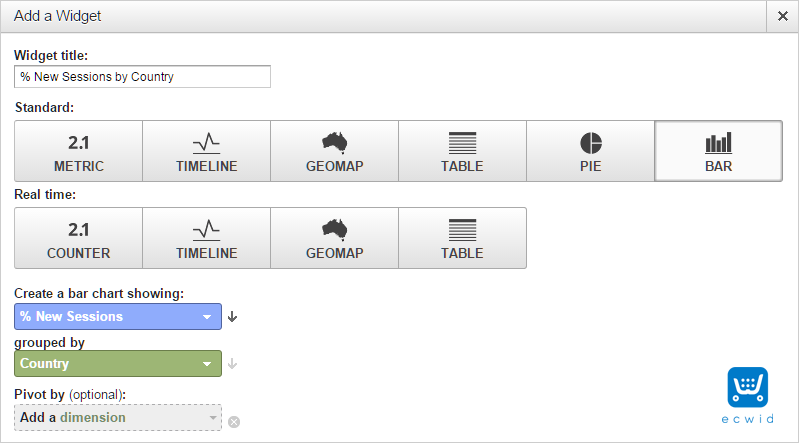 Enable e-commerce tracking inside of Google Analytics. That’s it! Within 24 hours, GA will start tracking data about visitors to your store and you can generate relevant reports to help you optimize your business. Before you can create custom reports and get insight into your business, it helps to familiarize yourself with the Google Analytics dashboard. Use this field to change the date range for each report. This graph shows changes in traffic on a daily basis. The default view shows the total number of sessions. This section shows critical traffic and engagement data, including pageviews, bounce rate, and length of each visit. Generally speaking, your objective should be to increase a visitor’s average session duration, reduce the bounce rate, and increase pageviews. This pie chart gives you a quick overview of the number of repeat vs. new visitors. A larger number of repeat visitors indicates loyal, returning customers. Use the Dashboard section to create custom dashboards for you or your team. The Shortcuts section gives you quick access to frequently used reports. Intelligence Events gives you alerts to significant changes in your site’s traffic or other statistics. The Real Time dashboard shows you traffic and engagement figures on a live, real time basis. Use the Audience section to drill down on data related to your audience’s location, browser, platform, demographics, and interests. You can also do cohort analysis and visualize your audience’s flow through your site. The Acquisition section shows you how you acquired your customers, whether through search, social, referrals, advertising, or direct visits from typing your site’s URL into the browser bar. Use the Behavior tab to understand how visitors interact with your site. Besides measuring site speed and content popularity on a per-page basis, you can also conduct A/B testing here to identify the best possible page layout for maximum engagement. The Conversions section is useful for tracking conversion rates for your stated goals. There is also a separate tab for e-commerce tracking which enables you to check sales and product performance. It’s easy to get overwhelmed with all these tabs and sections, but as an e-commerce store owner, you won’t need to use more than a few reports. The most important thing to know right now is to get comfortable navigating through GA and familiarize yourself with the data that appears in different sections. For example, if you wanted to see a traffic breakdown by source, you would go to Acquisition → All Traffic → Channels. This would show you how many visitors you received from each traffic source. You can see a further breakdown of traffic by going to All Traffic → Source/Medium. These reports are incredibly powerful, but they don’t give you all the data you need at a glance. For that, you need a custom dashboard. The dashboard is the heart of Google Analytics. While you can view individual reports by navigating to each section, the dashboard gives you critical data about your store in a single glance. The first thing you’ll want to do in GA is to create a custom dashboard for your store. Once created, you can customize it to show different segments and metrics such as traffic, revenue, conversion rates, etc. Choose Starter Dashboard, give it a name, and click on Create Dashboard. Here, you can choose a name for the widget and the graph type. You may also change the metric it displays, as well as the widget’s grouping. Once you hit Save, this widget will be added to your dashboard. By default, GA shows data from All Sessions — this means it will initially show you all traffic, regardless of the source. You can change this to only show data to your liking, whether it’s new visitors, paid traffic, organic traffic, mobile traffic, and so on. By getting data from different sessions and creating custom widgets, you can get powerful insight into your store’s performance. Of course, working with all this data can be confusing for anyone new to analytics. If you have specific questions, odds are that someone else has had them before. Check out the GA help forum to get better insight into how custom dashboards work. One of the most powerful resources for Google Analytics is the GA Solutions Gallery. 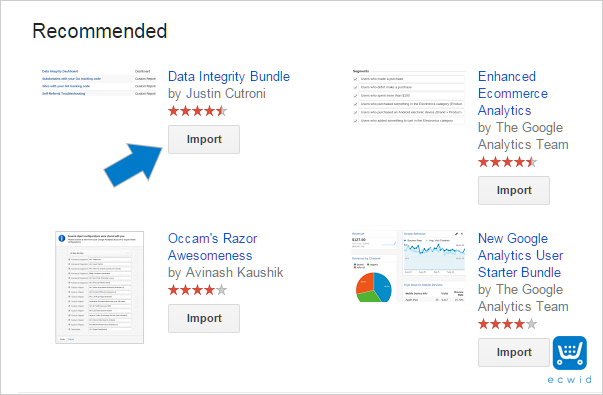 This is a curated collection of custom dashboards, segments, and reports from the Google Analytics team. It’s a wonderful resource for small business owners struggling to understand how GA reports actually work. You can use one of these solutions templates for your own store by clicking the Import button that appears next to the template name. Alternatively, you can use these reports by logging into your Analytics account and going to Dashboard → New Dashboard. On this screen, click on Import from Gallery to create a custom dashboard from the GA Solutions Gallery. You don’t have to use any of the dashboards from this gallery yourself, but it’s highly recommended that you do when you’re starting out. Not only will you get a better understanding of how the pros organize their data, but you’ll also save a lot of time when first starting out. This is the simplest e-commerce report you can have. It simply tracks the number of purchases or revenue against the number of visitors. It focuses on the single most important thing for store owners—revenue—and measures its changes against your traffic stats. You can grab this report here from the Solutions Gallery. You don’t need to create a custom dashboard for this. Once you enable e-commerce tracking, you can access crucial data about your store’s performance from the default GA dashboard itself. Find this report by going to Conversions → E-commerce — Overview. Here, you can view the number of transactions, the performance of individual products, the time until purchase, and get an overview of your e-commerce performance at a glance in terms of conversion rate (you can also change this to revenue, average value of each order, quantity, and the like). Portent created this dashboard to track the most important metrics for any e-commerce business: revenue, traffic, growth, and content efficiency (in decreasing order of importance). You can grab this dashboard from the Solutions Gallery here. Read about how and why Portent created this dashboard here. Think of this dashboard as a more powerful version of Portent’s perfect dashboard discussed above. Instead of simply tracking revenue, this dashboard also tracks e-commerce transactions by product, category, or SKU. It also demonstrates a smart use of Advanced Segments, which is great if you want to learn how to use them in your own reports. You can grab the All-in-one E-commerce dashboard here. In survey after survey, email continues to rank among the best channels for customer acquisition and engagement. You’ve likely seen this with your own store operations as well. Keeping track of the performance of your email marketing is crucial to the long-term success of your store. This simple dashboard will help you measure the performance of your emails in terms of revenue. It’s very useful for any e-commerce store, regardless of the niche it serves. These 5 dashboards and reports are enough to you well on your way with e-commerce analytics. Feel free to experiment with different segments and create your own widgets to get the data you really need. Remember: each store is different, and there’s no one-size-fits-all solution. While a standard Revenue — Traffic dashboard might work for some stores, it might not work for others. Google Analytics is a must-have tool for e-commerce stores. It can give you deep insight into your customers while helping you keep track of sales, traffic, and conversion rates. And it’s free! Google Analytics helps you understand your customers, track sales, and track traffic. You can integrate Google Analytics into your Ecwid store by adding your GA property ID to your Ecwid store settings. You can create custom dashboards with different widgets to get the data you need at a glance. You should experiment with different segments to drill down on data from specific sources. 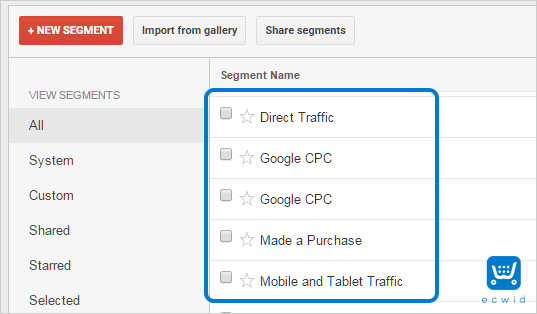 Use pre-built dashboard templates from Google Analytics Solutions Gallery to more easily get the data you want.